This rich dessert is a variation of the traditional Spanish dessert called "Flan." 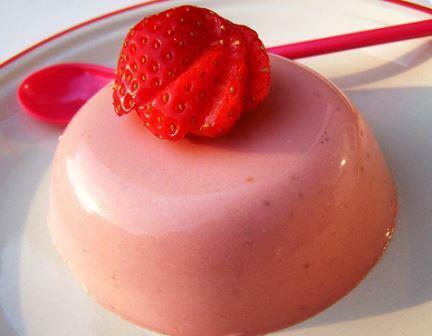 Instead of vanilla, this flan is flavored with fresh strawberries. Optional: Reserve about 4-5 diced fresh strawberries for garnish. Put a heavy skillet or saucepan over medium heat for 30 seconds. With the back of a wooden spoon, keep sugar moving constantly in skillet until sugar is completely melted, and of a rich medium brown color (caramelized). Pour caramelized sugar into each of the ramekins. Set aside. Place each ramekin into a large open, oven-proof pan, such as a broiler pan. Add very hot water to the pan. The ramekins should be submerged approximately 3/4 in the water. In Spanish, a “water bath” is called a “baño Maria”. Carefully place the pan on to the middle shelf of the oven and bake for 30 minutes. After 30 minutes, carefully remove each ramekin from the water, uncover and to allow to cool. Once cool, place in refrigerator to chill. When you are ready to serve, run a paring knife around the outside of each ramekin to loosen the flan. Then, place the serving plate on top of each one and flip it over. It may be necessary to tap the ramekin to force the flan to fall out onto the plate. Garnish with fresh strawberries and mint. Serve.